Over the last forty years, graffiti and street-art have become a global phenomenon within the visual arts. Whilst they have increasingly been taken seriously by the art establishment (or perhaps the art market), their academic and popular examination still remains within old debates which argue over whether these acts are vandalism or art, and which examine the role of graffiti in gang culture and in terms of visual pollution. Based on an in-depth ethnographic study working with some of the world’s most influential Independent Public Artists, this book takes a completely new approach. Placing these illicit aesthetic practices within a broader historical, political, and aesthetic context, it argues that they are in fact both intrinsically ornamental (working within a classic architectonic framework), as well as innately ordered (within a highly ritualized, performative structure). Rather than disharmonic, destructive forms, rather than ones solely working within the dynamics of the market, these insurgent images are seen to reface rather than deface the city, operating within a modality of contemporary civic ritual. The book is divided into two main sections, Ornament and Order. 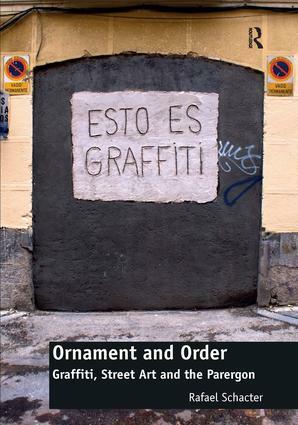 Ornament focuses upon the physical artifacts themselves, the various meanings these public artists ascribe to their images as well as the tensions and communicative schemata emerging out of their material form. Using two very different understandings of political action, it places these illicit icons within the wider theoretical debate over the public sphere that they materially re-present. Order is focused more closely on the ephemeral trace of these spatial acts, the explicitly performative, practice-based elements of their aesthetic production. Exploring thematics such as carnival and play, risk and creativity, it tracks how the very residue of this cultural production structures and shapes the socio-ethico guidelines of these artists’ lifeworlds. Rafael Schacter is a Researcher in the Department of Anthropology, University College London and British Academy Postdoctoral Fellow 2014-2017 also at University College London.